Aorto-left ventricular tunnel (ALVT) is a congenital extracardiac channel connecting the ascending aorta above the sino-tubular junction to either left or right ventricular cavity. It is extremely rare with incidence as low as 0.001% of all congenital heart diseases. Most of the patients develop symptoms of heart failure during the first year of life. The onset, severity and progression of heart failure vary and ranges from in-utero fetal death  to asymptomatic adulthood. The heart failure in neonate is due to acute stress on the myocardium from the fetal circulation to transitional circulation. Onset of heart failure depends on the cross-sectional area of tunnel and the amount of aortic regurgitation. Chronic preload due to regurgitation leading to left ventricular (LV) dilatation is seen in asymptomatic grown-up patients. Early diagnosis and surgical correction are essential to prevent irreversible myocardial dysfunction and heart failure. We report our experience of ALVT from a single center. This is a retrospective study from a single center from June 2004 to August 2013. Records of all cases with a diagnosis of ALVT were reviewed and various parameters were analyzed. LV dimensions and fractional shortening were measured. The outcomes of the surgery and transcatheter therapy were analyzed. All surviving patients were evaluated during follow-up. The surgery was performed under standard cardiopulmonary bypass (CPB) technique using right atrial cannulation and moderate hypothermia. The tunnel was visualized as an external bulge on the aorta at right sinus of Valsalva. The aorta was opened and the entire tunnel was inspected. Aorta was dilated and a varying degree of aortopathy was noted in most of the cases. Both the aortic and LV openings of the tunnel were identified. 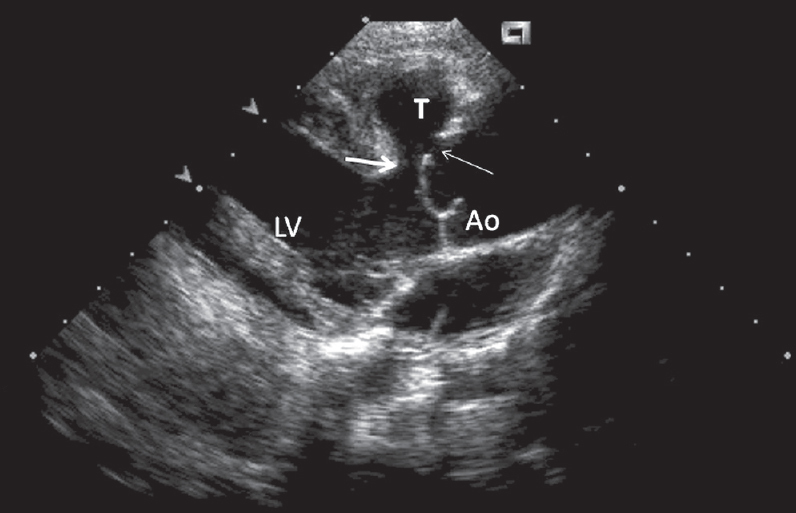 The oval-shaped aortic opening was seen extending from the right side of sino-tubular junction to LV opening through interventricular septum [Figure 3]. Some degree of aortic valve deformation and sagging of right coronary cusp was observed in all cases. Cold blood cardioplegia was delivered selectively into the coronary arteries. The aortic side of the tunnel was closed using Glutaraldehyde-treated autologous pericardium, whereas the LV side was closed using a Dacron patch. In case of Bentall procedure, only the right coronary button was attached to the graft while the left coronary was left in its native position. The patients were managed with moderate inotropic support using dobutamine and noradrenaline. Bilateral femoral artery access was obtained after informed consent under standard aseptic precautions. Heparin 100 units/kg was administered. Ascending aortogram using pigtail catheter was done in antero-posterior and standard left anterior oblique views. The defect was crossed with the angulated guide wire (Terumo Medical Corp., Tokyo, Japan) using Judkins right coronary catheter. The catheter was advanced into LV and exchanged for Amplatzer extra stiff wire. The appropriate delivery sheath was advanced into LV. The Amplatzer muscular device was selected 1-2 mm higher than the maximum dimension at its opening in the aorta. The LV disc was deployed at the entry point of the tunnel and aortic disc was deployed in the ascending aorta at its exit point. A check angiogram in the LV and ascending aorta was performed in both cases [Figure 4]. A TTE was done to check the position and interference with aortic valve before delivery of the device. Follow-up was available for all patients. Follow-up assessment includes clinical evaluation, chest X-ray and transthoracic echocardiogram to evaluate neo-aortic regurgitation and ventricular function. The baseline characteristics are given in the [Table 1]. There were seven patients diagnosed to have ALVT. The age ranged from 7 days to 45 years. All patients presented with varied degrees of heart failure. There was wide pulse pressure and signs of aortic run off in all. To and fro murmur was present in all patients. Cardiomegaly with cardiothoracic ratio of more than 0.7 was universal in the study group. ECG showed significant left ventricular forces. TTE confirmed the diagnosis in all cases. The mean left ventricular internal dimension in end diastole (LVIDd) 'z' score was 4.6 ± 1.06 cm and mean LV ejection fraction (EF) was 29 ± 6.5%. The color Doppler demonstrated to and fro flow in the tunnel due to systolic forward flow and diastolic non-valvular regurgitation. There was mild native aortic valve regurgitation in four, moderate in one and severe in two. Four patients underwent primary surgical closure of the defect [Flow chart]. 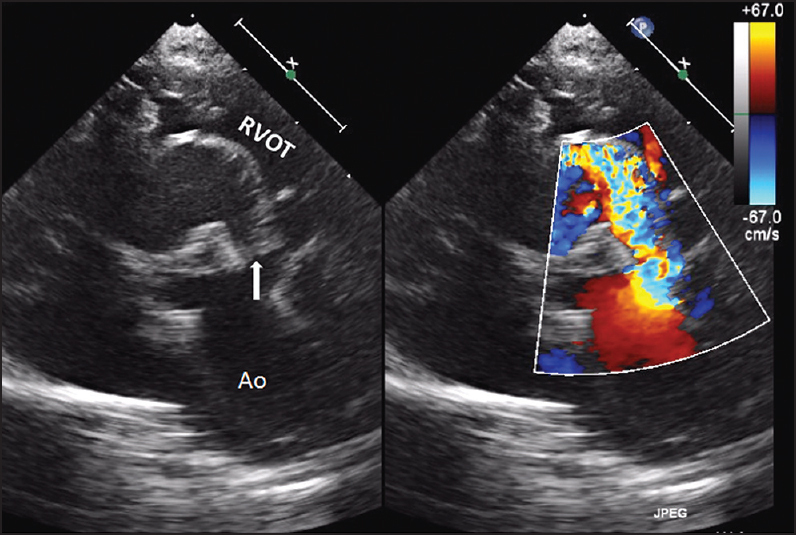 Associated dilatation of the ascending aorta and severe aortic regurgitation was seen in one adult patient who needed the Bentall procedure. One patient developed moderate ventricular dysfunction needing ventilatory support for three days and remaining were extubated on the next day. There were no arrhythmias noted in the immediate postoperative period. There were two neonates with heart failure who underwent surgical correction within a week after the diagnosis. One baby developed mild hypoxic cerebral injury due to CPB. This child had a 7 mm residual defect leading to progressive LV dilatation and hence, an elective transcatheter closure using 8 mm Amplatzer muscular device was done at one year of age. One 11-year-old boy had perforation in left coronary cusp (LCC) with severe aortic regurgitation along with ALVT; the tunnel was closed and aortic valve was repaired in this patient. On follow-up, he had moderate aortic regurgitation and moderate LV systolic dysfunction. Another 12-year-old boy underwent primary transcatheter device closure of tunnel using a 14 mm Amplatzer muscular device. He developed severe hemolysis due to significant shunt through the device necessitating the removal of the device followed by surgical closure of the tunnel. On follow-up after two years, he underwent Ross procedure for progressive aortic regurgitation and aortic root dilatation. The median follow-up of the study population was 3 years (range: 1.5-9 years). The families of two patients did not opt for any active management. Both were older children with large tunnels. One was a 10-year-old girl who died from pulmonary edema during follow-up. The second patient was a 13-year-old boy who succumbed to sudden cardiac death one year after the diagnosis. The remaining patients are under regular follow-up. ALVT is an extracardiac channel that connects the ascending aorta above the sino-tubular junction to the cavity of the left or right ventricle. Thus far, approximately 130 cases have been reported in the literature of which more than 90% terminated in the left ventricle, and hence the name aorto-left ventricular tunnel; the remaining tunnels terminated in the right ventricle. The aortic opening of most tunnels lies above the right coronary sinus of Valsalva as noted in our patients. In all the reported series, this defect is twice as common in males as in females. There were many speculations about etiology of the tunnel, ranging from congenital to acquired nature of the defect. Prenatal diagnosis of ALVT has put to rest the theory of acquired nature of the defect. Most logical explanation comes from the Developmental theory by McKay. The cushions from which aortic and pulmonary sinuses are formed with their respective valve leaflets are separated by an extracardiac tissue plane, due to regression of the surrounding muscle. It is the same muscle plane that initially forms the cuff around the coronary arteries and which later regresses and then coronary arteries join aortic sinuses. Failure of this tissue plane to develop normally might then result in a tunnel above one of the facing aortic sinuses and also explain the potential involvement of the proximal coronary arteries and valve leaflets, which is frequent in ALVT. Echocardiography is the single most important test for the diagnosis of ALVT; cardiac catheterization is required only in those cases with inadequate information about coronary artery anatomy. Parasternal views are particularly useful in understanding the origin of the tunnel above the coronary ostium, its length and opening into one of the ventricles. ALVT never passes through myocardium to reach the cavity of the ventricle, a feature that differentiates it from coronary-cameral fistula. Another close differential diagnosis is a ruptured sinus of Valsalva aneurysm, which has its orifice in the sinus of the aortic valve. The aortic opening of most tunnels lies above the right coronary sinus. Hovaguimian et al., have proposed an anatomic classification of aorto-ventricular tunnels;  Type 1: Slit-like opening at the aortic end with no valve distortion, Type 2: Large extracardiac aneurysm, Type 3: Intracardiac aneurysm of the septal portion of the tunnel, with or without right ventricular outflow tract obstruction, Type 4: Combination of Types 2 and 3. Medical management is only for control of heart failure in neonates and while awaiting surgery. Without surgical treatment, most patients die early in life due to congestive heart failure as noted in two of our patients. Therefore, medical management should be of limited duration and should be only to prepare the patient for surgery. No aortic cusp distortion or significant valvular aortic regurgitation, which will necessitate surgical correction. Probably Type 1 of Hovaguimian classification and postoperative residual defects as observed in one of our patients are the best candidates. One should be aware of incomplete closure of the defect that may lead to massive hemolysis and removal of the device as observed in one of our series. Regular follow-up even after correction of the tunnel is mandatory since progressive aortopathy and aortic regurgitation may develop as seen in two of our cases. Valvular aortic regurgitation is a major long-term complication after surgery, requiring valve replacement in as many as 50% of reported cases. ,, Causes of acquired aortic incompetence are multiple such as unsupported aortic cusp, progressive aortic root dilatation or perforations in leaflet due to hydrodynamic trauma. Concomitant aortic valve abnormalities or surgical distortion of the valve leaflets can also lead to aortic regurgitation. Progressive aneurysmal dilatation of the aortic root in patients repaired at an older age is important and avoidable because of aortic regurgitation. Hence, early correction is indicated not only to prevent heart failure but also to prevent progression of damage to the aortic valve. Although it was observed that patients who were operated within the first six months of life had documented normalization of left ventricular size and function,  the etiology of progressive dilatation of aortic root and development of valvular aortic regurgitation noted in patients who underwent tunnel closure in early infancy is yet unknown. Okoroma EO, Perry LW, Scott LP, McClenathan JE. Aortico-left ventricular tunnel: Clinical profile, diagnostic features and surgical considerations. J Thorac Cardiovasc Surg 1976;71:238-44. Sousa-Uva M, Touchot A, Fermont L, Piot D, Delezoide AL, Serraf A, et al. Aortico-left ventricular tunnel in fetuses and infants. Ann Thorac Surg 1996;61:1805-10. Kafka H, Chan KL, Leach AJ. Asymptomatic aortico-left ventricular tunnel in adulthood. Am J Cardiol 1989;63:1021-2. Kouchoukos NT, Blackstone EH, Hanley FL, Kirkilin JK. Congenital sinus of Valsalva aneurysm and Aortico-left ventricular tunnel, Kirkilin/Barratt-Boyes cardiac surgery. Ch. 36, 4 th ed, Philadelphia, Elsevier. p. 1326-41. McKay R. Aorto-ventricular tunnel. Orphanet J Rare Dis 2007;2:41. Grab D, Paulus WE, Terinde R, Lange D. Prenatal diagnosis of anaortico-left ventricular tunnel. Ultrasound Obstet Gynecol 2000;15:435-8. Bonnet D, Bonhoeffer P, Sidi D, Kachaner J, Acar P, Villain E, et al. Surgical angioplasty of the main coronary arteries in children. J Thorac Cardiovasc Surg 1999;117:352-7. Martins JD, Sherwood MC, Mayer JE Jr, Keane JF. Aortico-left ventricular tunnel: 35 - year experience. J Am Coll Cardiol 2004;44:446-50. Bitar FF, Smith FC, Kavey RE, Kveselis DA, Byrum CJ, Brandt B, et al. Aortico-left ventricular tunnel with aortic atresia in the newborn. Am Heart J 1993;126:1480-2. Martin Jimenez J, Gonzales Diegues CC, Quero Jimenez C, Rico Gomez F, Bermudez Canete R, Quero Jimenez M. Aortico-left ventricular tunnel associated with pulmonary valve stenosis. Rev Esp Cardiol 1996;49:921-4. Knott-Craig CJ, van der Merwe PL, Kalis NN, Hunter J. Repair of aortico-left ventricular tunnel associated with subpulmonary obstruction. Ann Thorac Surg 1992;54:557-9. 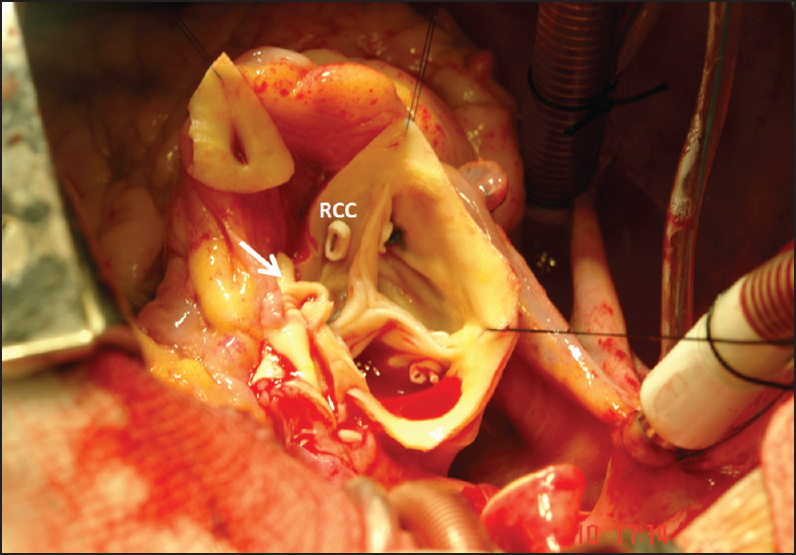 Hovaguimian H, Cobanoglu A, Starr A. Aortico-left ventricular tunnel: A clinical review and new surgical classification. Ann Thorac Surg 1988;45:106-12. Mueller C, Dave H, Prêtre R. Surgical repair of aorto-ventricular tunnel. Multimed Man Cardiothorac Surg 2012;2012:mms006. Sadeghpour A, Peighambari M, Dalirrooyfard M, Esmailzadeh M, Maleki M, Noohi F, et al. Aorta-to-left ventricle tunnel associated with noncompaction left ventricle. J Am Soc Echocardiogr 2006;19:1073.e1-5. Vida VL, Bottio T, Stellin G. An unusual case of aorto-left ventricular tunnel. Cardiol Young 2004;14:203-5. Chessa M, Chaudhani M, De Giovanni JV. Aorto-left ventricular tunnel: Transcatheter closure using amplatzer duct occluder device. Am J Cardiol 2000;86:253-4. McKay R, Anderson RH, Cook AC. The aorto-ventricular tunnels. Cardiol Young 2002;12:563-80. 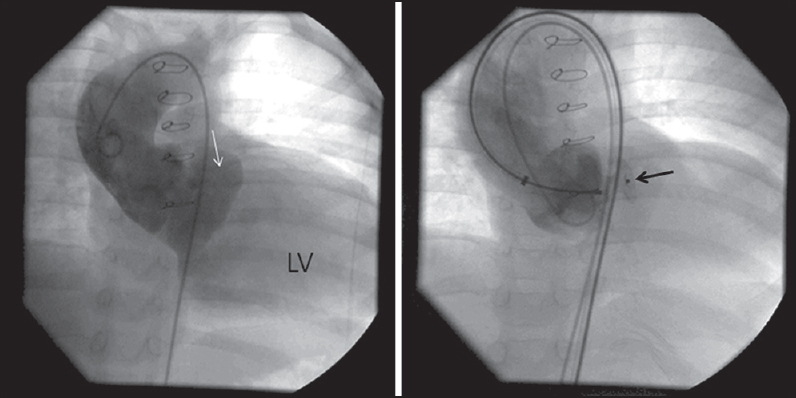 Bjork VO, Eklof O, Wallgren G, Zetterqvist P. Successful surgical treatment of an aortico--left ventricular tunnel in a four-month-old infant. J Thorac Cardiovasc Surg 1979;78:35-8. Ho SY, Muriago M, Cook AC, Thiene G, Anderson RH. Surgical anatomy of aorto-left ventricular tunnel. Ann Thorac Surg 1998;65:509-14. Grunenfelder J, Zund G, Pretre R, Schmidli J, Vogt PR, Turina MI. Right coronary artery from aorto-left ventricular tunnel: Case report of a new surgical approach. J Thorac Cardiovasc Surg 1998;116:363-5. Serino W, Andrade JL, Ross D, de Leval M, Somerville J. Aorto-left ventricular communication after closure. Late post-operative problems. Br Heart J 1983;49:501-6. Meldrum-Hanna W, Schroff R, Ross DN. 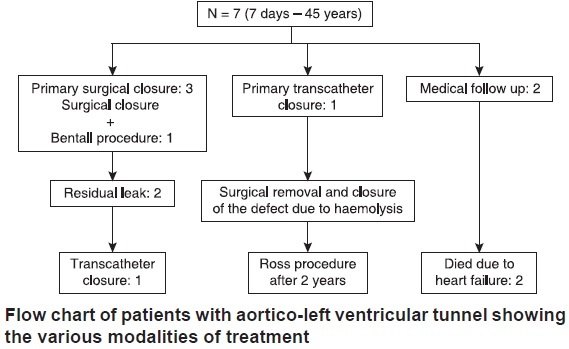 Aortico-left ventricular tunnel: Late follow-up. Ann Thorac Surg 1986;42:304-6. Somerville J, English T, Ross DN. Aorto-left ventricular tunnel. Clinical features and surgical management. Br Heart J 1974;36:321-8. Edwards JE. Editorial: Aortico-left ventricular tunnel: The case for early treatment. Chest 1976;70:5-6.